Appeal from the International Anarchist Defence Fund, project of the Anarchist Black Cross and related groups. So, as our next steps, we have identified reaching out to all possible anarchist groups, asking them to spread information about the fund, spread our flyers, put a banner on their websites, putting advertisements in anarchist magazines, etc. But the problem is that we don’t know so many languages and contexts, that’s why we need the help of volunteers from all imaginable countries and regions who would help us compile a comprehensive list of anarchist collectives in their regions, get links to their websites and contacts, identifying sites with open publication, etc. 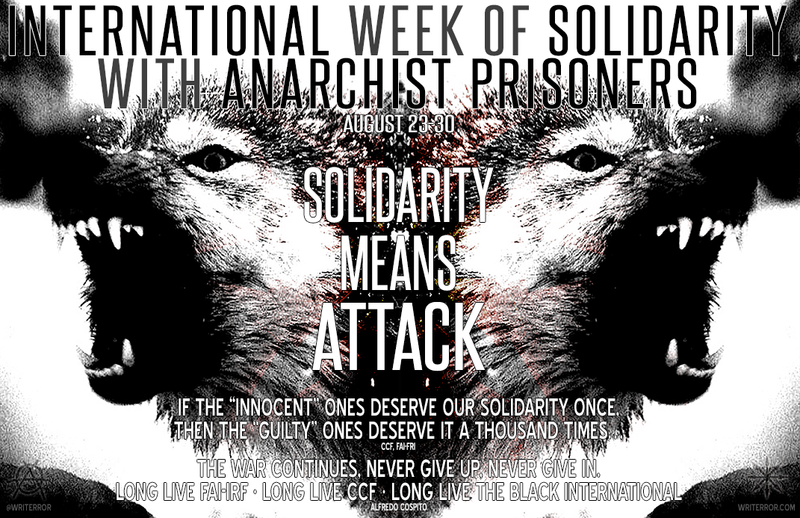 Above: Banner of solidarity hung by Utopia AD, Greece, with the prison labour strike of the US prisoners and with the anarchist prisoners around the world. 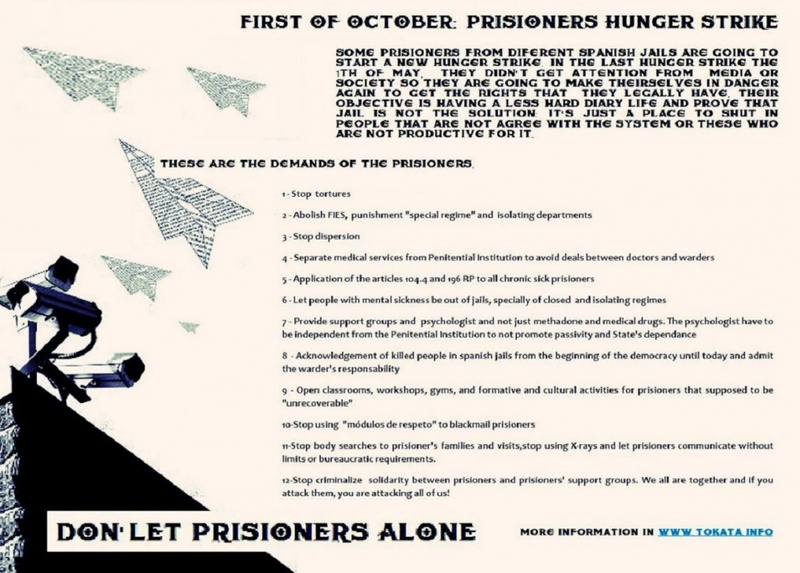 Solidarity text to prisoners of “Lee Correctional Institution” prison of U.S.A. Call for a week of anti-fascist agitation and propaganda, due to the growth and visibility that far-right groups have achieved in recent times which has reached into spaces in the mainstream media, in neighborhoods and in bourgeois politics. Because of the above it is necessary that we make ourselves present everywhere, mainly in the streets, making it clear that the intention is not only to act in an effective manner to fascist provocations, but to act in an offensive manner, permanently promote an anti-authoritarian attitude, to make visible, question and stress the daily reproductions of fascist attitudes such as racism, xenophobia, sexism and homo/transphobia. We are present with Heather Heyer, Rodrigo Lanza and those who confront fascism in any of its forms. La “Red Solidaria Antikarcelaria con Juan y Marcelo” converge en los momentos en que nos llega la feliz noticia de que nuestro compañero Freddy Fuentevilla Saa logra pisar las calles nuevamente el 18/06/2018 tras 10 años y 3 meses de prisión ininterrumpida. Mientras por otro lado se encuentra la difícil situación de salud del compañero Juan y las duras condenas de la justicia militar que recaen sobre Marcelo. Por lo que como “Red Solidaria” nos empeñamos en agitar y difundir estas dos batallas que están dando los compañeros en prisión. Estas situaciones son delicadas y urgentes, es necesario visualizarlas, ponerlas sobre la mesa. Por lo que llamamos a todos/as las mentes concientes, a los/as autónomos/as, libertarios/as y subversivos/as a apoyar de forma real y concreta a Juan y Marcelo; ¡Aunemos!